I know the NFL playoffs are today and the Super Bowl is coming up, and whether you're a fan of the Jets, Packers, Steelers or uhhh....the Bears?...I'm sure you'll be watching one way or another, regardless of if your favorite team made it all the way or not. Here's a little snack to keep on the end table while the guys are guzzling down beer and you're stealing the remote away in an attempt to not let them change the channel during the Super Bowl commercials (arguably the best part!). It's very easy to make and a nice little treat. 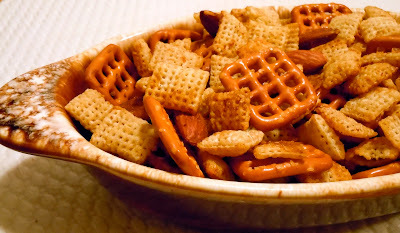 I've been taking it to work to munch on during the day and it's a great late night snack, too. If you keep in in an airtight container it will keep for a couple weeks! Plus it tastes very similar to the packaged mix! Oh, and if your team loses, it's light enough so if thrown at the TV in frustration it won't make too much of an impact. 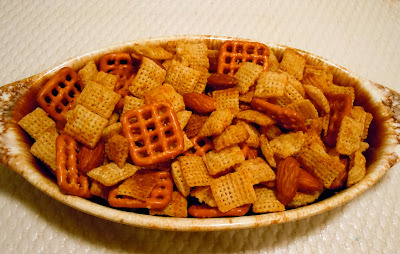 In large bowl, mix cereal, almonds and pretzels. Set aside. In ungreased roasting pan, melt the butter in the oven. Add seasonings and mix well. Gradually stir in the cereal mixture until evenly coated. Bake for 1 hour, stirring every 15 minutes. Spread on paper towels to cool. Store in airtight container.